Designed for growing small businesses, branch offices and school campuses, the SonicWALL NSA 2600 delivers critical threat protection by preventing intrusions, blocking malware and eliminating access to questionable web content. It includes essential core features such as secure remote access, site-to-site VPN and WAN failover/load balancing, combined with SonicWall acclaimed ease of use and high value. Deep network security that grows with your business. Designed for growing small businesses, branch offices and school campuses, the SonicWALL NSA 2600 delivers critical threat protection by preventing intrusions, blocking malware and eliminating access to questionable web content. It includes essential core features such as secure remote access, site-to-site VPN and WAN failover/load balancing, combined with Dell’s acclaimed ease of use and high value. 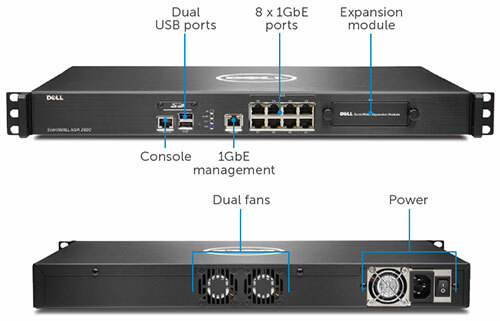 NSA 2600 SonicWall Security System Features. Dell SonicWALL NSA 2600 provides real-time insight and control of network traffic broken down by applications, users and content through intuitive on-board visualization. The ability to prioritize important applications, throttle down unproductive applications and block unwanted application components ensures an efficient and safe network. SonicWALL’s patented1 Reassembly-Free Deep Packet Inspection engine combined with the NSA 2600’s quad-core security platform is capable of inspecting thousands of simultaneous connections across all ports. The SonicWALL NSA 2600 provides Deep Packet Inspection across all interfaces with nearly zero latency and without file size limitation.